After millenia of monitoring, analysing and cataloguing every known alternate reality in existence, the Primal being known as Kronus has had enough. The constant revisions of existing universes as they experience ‘events’ that rewrite their history and reality, the almost infinite variations caused by the tiniest variance from the ‘Prime’ reality, the endless costume changes…it has become TOO much. Order needs to be restored. Utilising his vast intellect and extensive knowledge of quantum mechanics, Kronus has designed a machine – The Singularity Engine – which will compress every reality currently in existence into a single cohesive whole. Billions will die, but Kronus believes the end justifies the means. However, to complete the Engine, he requires artifacts of power from across the Multiverse. As he cannot act directly in each reality, he plans to recruit a variety of catspaws to retrieve them for him. The promise of wealth or power will be enough in most cases, but those who think of themselves as ‘heroes’ may require subtle manipulation to unknowingly act on his behalf. And there exists the risk that those who consider themselves guardians of their respective realities may discover his plans and try to stop him, so they will need to be targeted and removed from the equation. So, He-Month 3 or “March-sters of the Universe” draws to a close and whilst Roger over at Rantings from Under the Wargames Table has completed his three characters, namely Tri-klops, Trap Jaw and a rather superb Ram-Man, having built them almost from scratch, I was feeling slightly smug that I only need to add a few details to mine to complete them. However, the gods of wargaming do not look kindly upon those who become complacent and I have been troubled by recalcitrant paint brushes and paint that refused to go where I wanted it. Whilst I am done, I’m not entirely happy with what I’ve produced, but feel that further ‘faffing’ will result in making things worse, so I’ve decided to draw a line under it and show my less than sterling efforts for this round of He-Month. 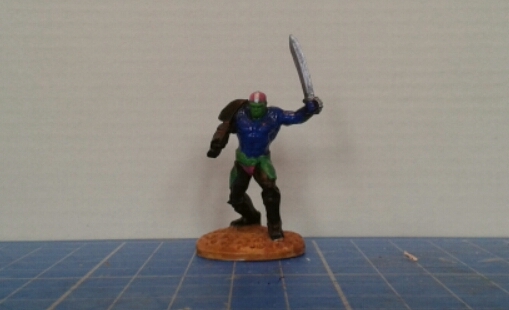 Next, we have Trap Jaw, who I’d decided that all he needed was the silver stripe on his helmet to be finished. 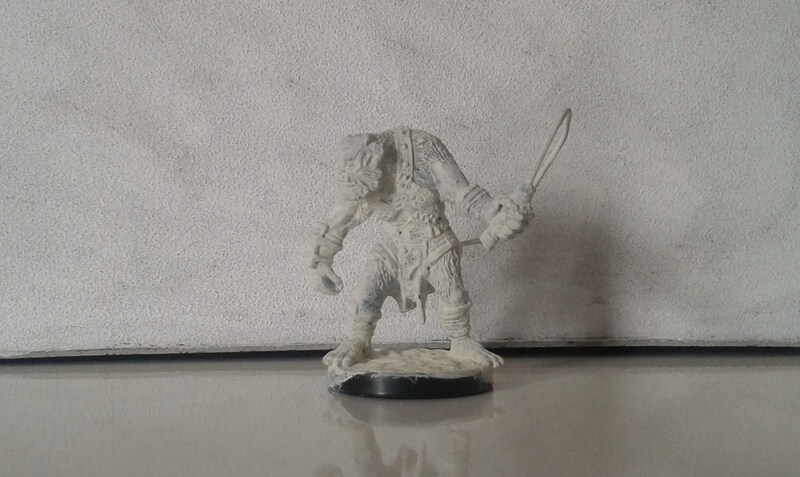 However, I then decided that I’d attempt to do a skull and crossbones on his shoulder pad and attempt to ‘paint in’ his jaw. This looked absolutely, shockingly crap, so I had to re-do his face and shoulder pad and washing his face resulted in me having to re-paint his torso too, as I ended up with green runs all down him. He is now done too, but I’m also less than happy with him. Finally, Tri-klops and whereas the other two caused me issues, Tri-klops was a dream and came out exactly as I’d hoped. I really think that this is one of my better conversions. Having done a bit of research regarding eye colour and shape, I decided that I’d just go for oval and red pupils, but did give him the ‘angry’ eye on the front, which has worked really well. So, six ‘heroes’, being Fisto, Teela, He-Man, Man-E-Faces, Man-at-Arms and Orko. Man-e-Faces is quite tall compared to the others, but I still think that of the ‘heroes’, Orko is my favourite. 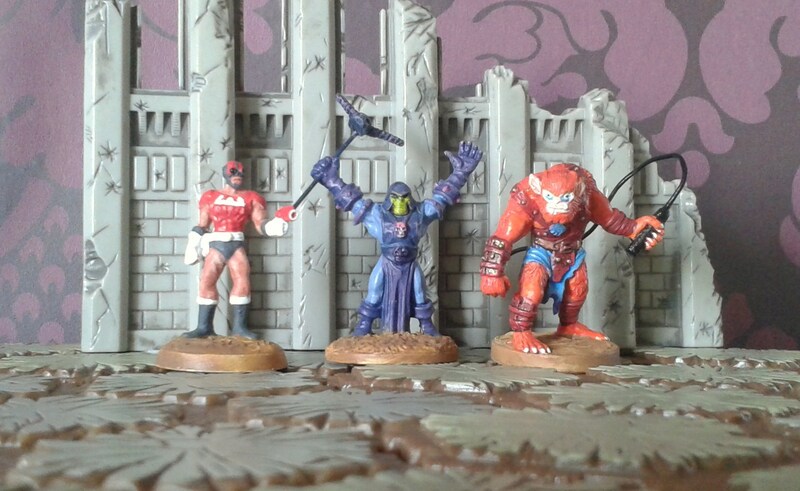 So, four villains – Trap-Jaw, Beast Man, Skeletor and Tri-Klops, with Zodac on the end, as otherwise we’d have too many in the other photo. Tri-klops is my new favourite here, followed by Beast Man. Comments and feedback appreciated and welcome. It’s all about the Power of Three…except for Trap Jaw, who decided to be bloody awkward. So, rather than Milliputting or gluing a helmet on, I decided to paint it on as a skullcap. I did initially attempt to do the same for his jaw, but it looked crap, so my version of Trap Jaw doesn’t actually have the ‘jaw’ part. I also decided to give him his signature purple pants, as otherwise his trousers would have been monotonously black. Pretty much done on this one too. I decided to paint the orange in ‘v’ of his tunic, to bring a bit more colour to the figure and match the chest panel the original figure has. He’s also had the previously dark grey parts inked black, had his green parts washed with Salamander Green and his flesh with Dwarf Flesh. 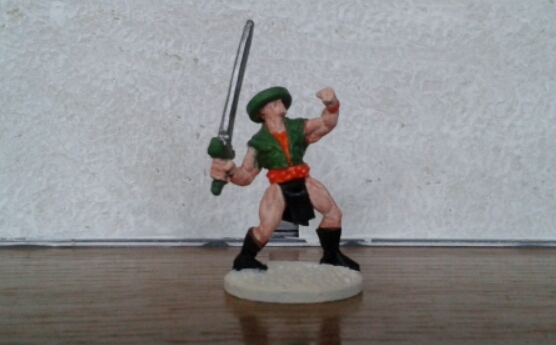 Just needs a wash on sword, the gems on his hilt picked out and his eyes painted on and he’s done. Following the colour scheme of the original figure, I’ve painted the front straps of his chest panel purple, as well as the armour plates on each hip. I also tidied up the blue sections and gave them another coat. 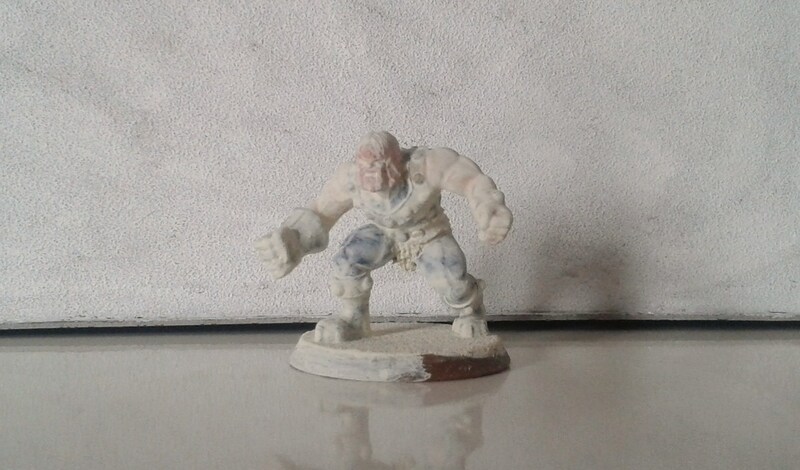 Finally, his ‘flesh’ parts were given a wash of dwarf flesh. Whilst this does highlight the cybernetic nature of his limbs, I still think he looks cool. I just need to apply a further brighter red to his gun, paint the red ‘mask’ associated with his human face, add some orange highlights to the central part of his chest panel and he’s pretty much done as well. Obviously, I still need to wash their bases as well. 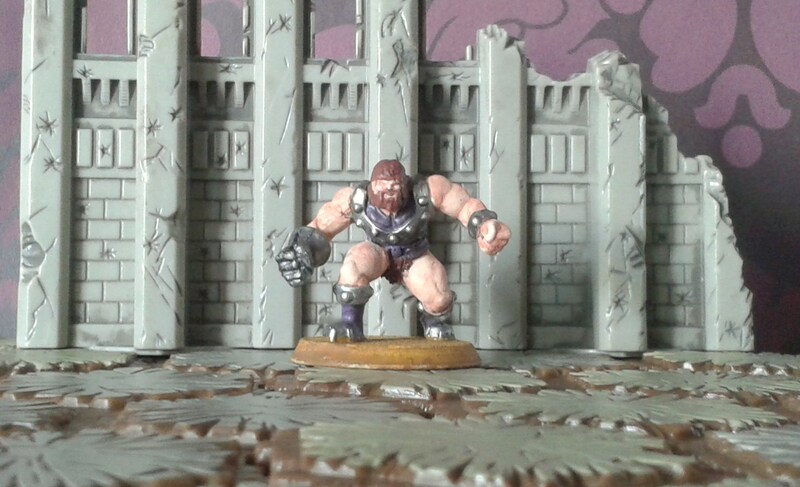 Of course, if you want more accurate representations of Trap Jaw, Tri-Klops and a particularly awesome Ram-Man, take a look at what Roger’s been up to over on Rantings from Under the Wargames Table. Comments and feedback welcome and appreciated. My regular followers will have noticed a lack of recent content on my blog, for which I apologise. Hopefully, this should work, so you’ll have to excuse any roughness as I get used to updating my blog in this fashion. Whilst I’ve always liked Trap Jaw as a character, the representations of him so far have been a little…rubbish. So my challenge was to not only make my version of him, but also make him cool. Trap Jaw screams cybernetic space pirate to me, so that’s how I’m approaching him. 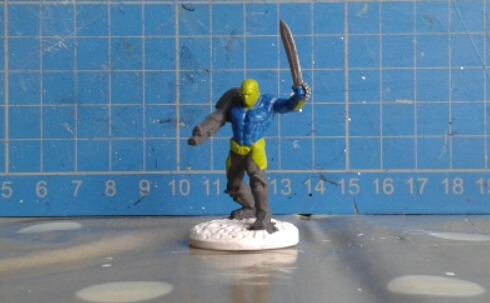 So, I first removed the lower blade on Drax’s ‘cutlass’ and his right arm. This was replaced with an arm from a GW ‘womble’ space marine, from which I’d cut away the actual arm, leaving the shoulder pad and bolter. And this is what I ended up with. For Man-E-Faces, I added a GW Laspistol to his right hand, then built up his helmet using Milliput, topping this off with an offcut of plastic sprue for the top. And this is what I ended up with. And for Tri-klops, I cut off Doc Samson’s right hand and the top half of his head. The hand was replaced one sourced from a Heroscape Tarn Viking, as this had the right type of sword. 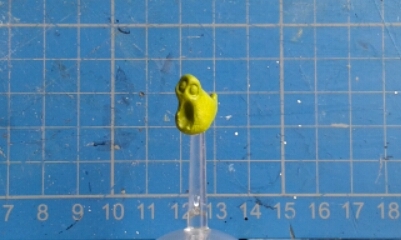 And this is where it gets really cunning, as I knew that I didn’t stand any chance of re-creating his visor with my sculpting skills, but I could find a shirt button of the right size and glue this to the top of his head, which was then topped off with another sprue offcut. As I always felt Tri-klops was a little bit ‘ronin’, I decided to give him a dangly skirt, rather than the standard hairy pants. And this is how he came out. Looks a little bit Mexican, like Zorro’s pulled his hat down over his eyes… However, as it came out exactly as I intended, I’m pretty happy. I’m trying to decide whether I give him ‘tattoos’ on his head,similar to how some pirates had skulls tattooed on their face, in place of an actual cybernetic jaw and skullcap. what does everyone think? So, hopefully worth the wait. I’m pretty pleased with how they look so far. Not completely operational, as we need to give the interior and exterior walls, doors and windows another coat of paint, finish the detailing on the containment grid and other equipment and obviously put some signage up. I found a Canadian company called FX Miniatures, who produce replica decals as both waterslide transfers and vinyl stickers, in a variety of scales, running from 1/87 to 1/10. They seem to mainly concentrate on police decals, but do have a selection of ‘Movie & TV’ stickers, including decals to transform the vehicle of your choice into a Mystery Machine, Love Bug or General Lee. And an Ectomobile, of course. So, I shall be purchasing some to not only decorate my Ectomobile, but also the Ghostbusters HQ as well – probably in 1/64, as I reckon this will be the right size. …who have added a further monstrosity to their number. 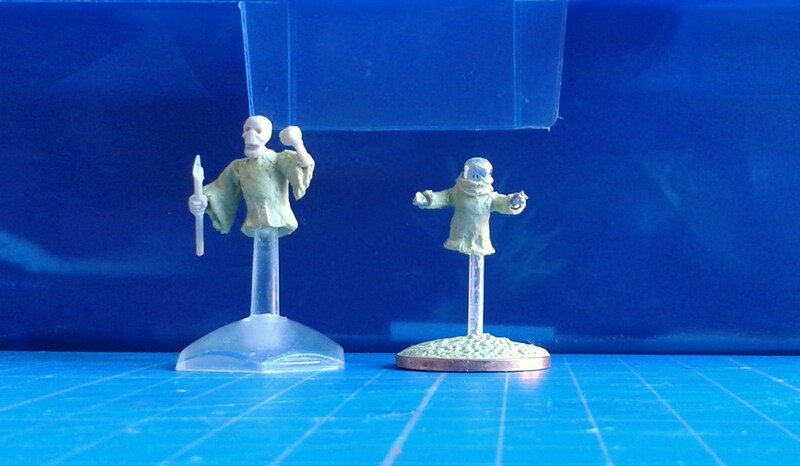 The figure in the centre is an D&D Miniatures Cerebrilith from the Night Below set. 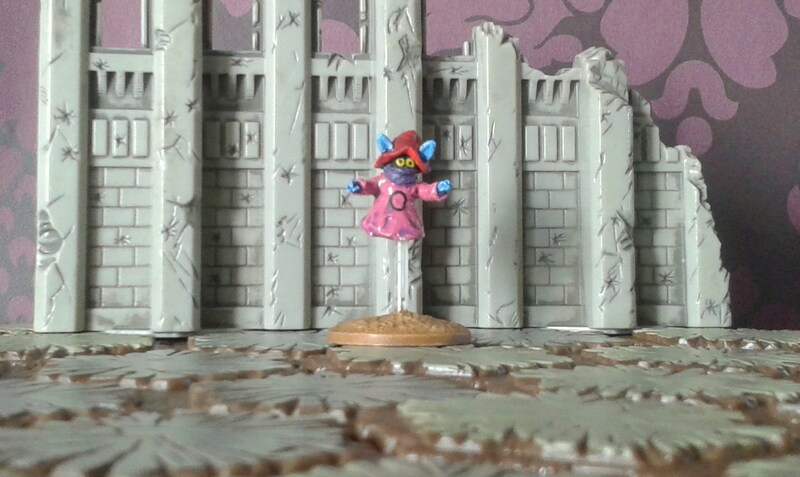 I originally bought this to bolster my Marro forces in Heroscape, as someone had produced a custom card for this figure, but as I’d already re-purposed my Marro Warriors as Soul Takers, I decided to repaint the Cerebrilith in the same colours. Not quite finished, but I think it makes a good addition to their forces, as it has a similar look. 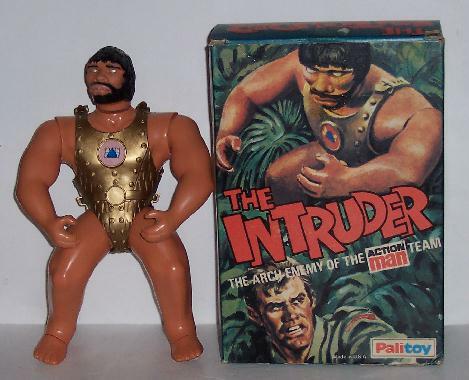 The figure is available from Troll and Toad for a very reasonable $3.49. As you can see, there are now quite a few, including my home-made Ithaqua the Wind-Walker, details of which can be found here. And this only includes the ‘ghosts’, as we still have were-creatures, mummies, vampires and some more pumpkin-headed monstrosities to come – although these may make an appearance when Enigma Investigations revisits the Buffet (details of their last visit can be found here). 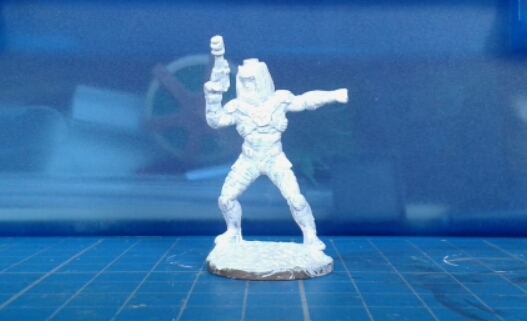 As noted above, March sees the return of He-Month, where Roger Webb over at Rantings from Under the Wargames Table and myself here will be re-creating characters from the Masters of the Universe franchise in 28mm, with varying degrees of success. However, you’ll have to wait until the next post to find out who they will (hopefully) end up as – feel free to guess away in the meantime. As the last few days of September fade into the Season of the Witch, it’s time to bid farewell to Eternia once more, as the second round of He-Month draws to a close. 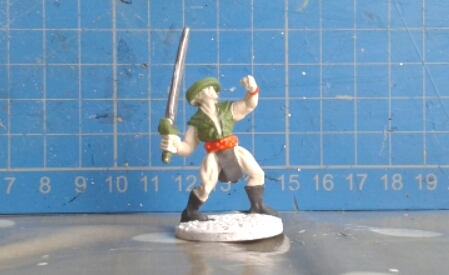 Those who have been following both myself and Roger Webb’s progress on our slight obsession with re-creating the denizens of Eternia in 28mm will know that Roger has already completed his three characters – namely Man-at-Arms, the Sorceress and Orko. 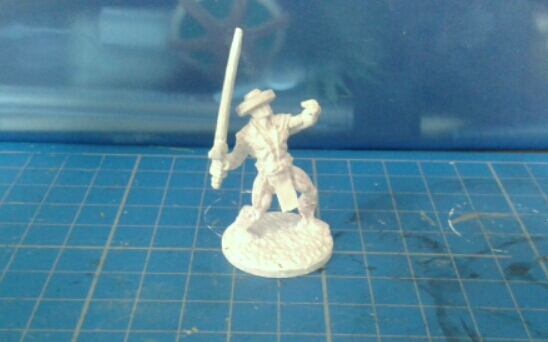 The results of his hard work and talent can be viewed over at his blog, Rantings from Under the Wargames Table. Go directly there now – you won’t be disappointed! 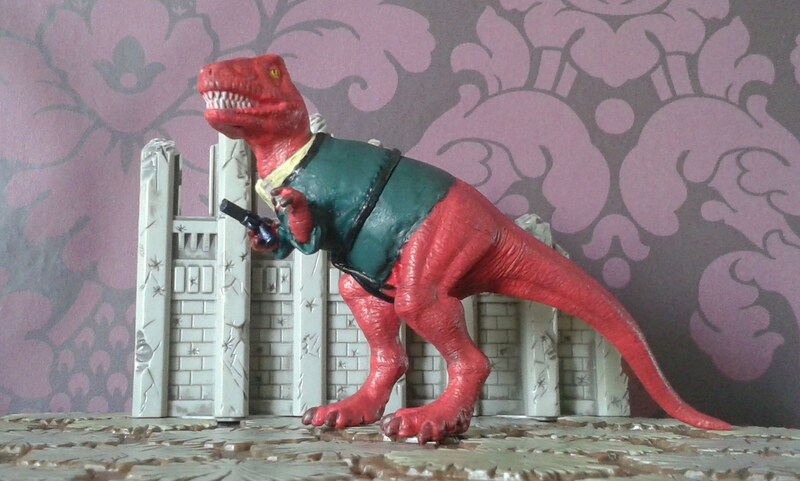 Due to the fact that I decided to add to my modest target of three Masters of the Universe characters – namely Fisto, Beast Man and Orko – by setting myself a further target of converting a cheap plastic dinosaur into a representation of Devil Dinosaur as he appeared in the Nextwave title from Marvel, I could have been setting myself up for a fall. Or in modern parlance, an Epic Fail. However, as my work decided to upgrade one of their essential computer systems this weekend, this resulted in an “extra” day off, so I leapt out of bed, paintbrush gripped between my teeth like an artistic pirate and in a flurry of activity, I have now finished everything! 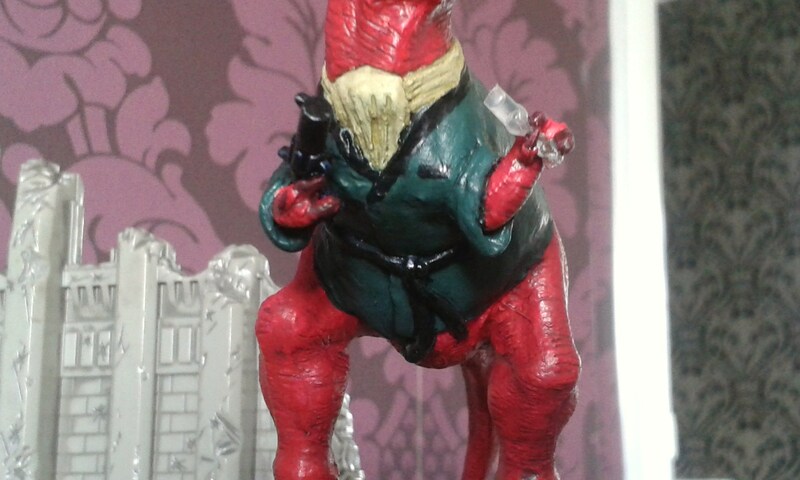 That’s right, not only do I have three completed Masters of the Universe characters, I also have my Devil Dinosaur finished! 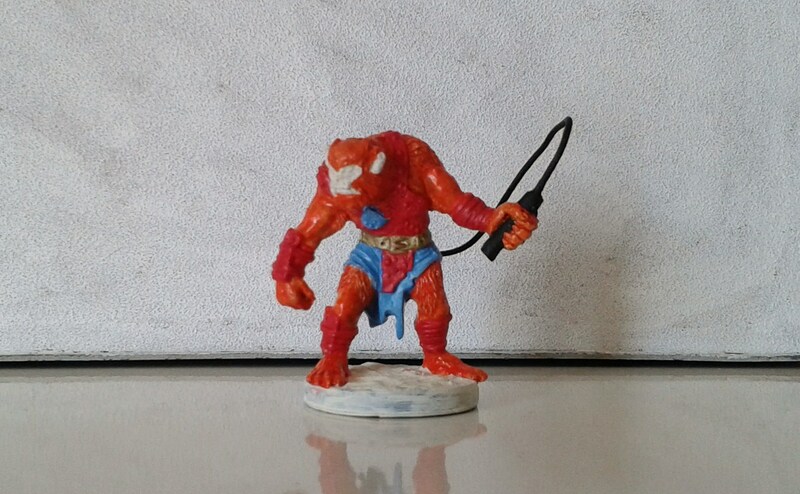 Next we have Beast Man, whose control of almost all natural animals led to a career as an animal trainer once the royalties from MOTU dried up. Having realised that the washes I’d previously used failed to bring out the needed details, I went darker and am now happy with the results. I have also added details, such as his claws, studs on his harness, a black ink wash on his whip and actually managed to do his eyes, including the blue eye-shadow(?) that he sports. 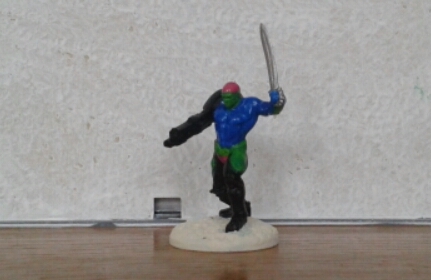 A quick paint of his base and he joins Skeletor on the side Evil. 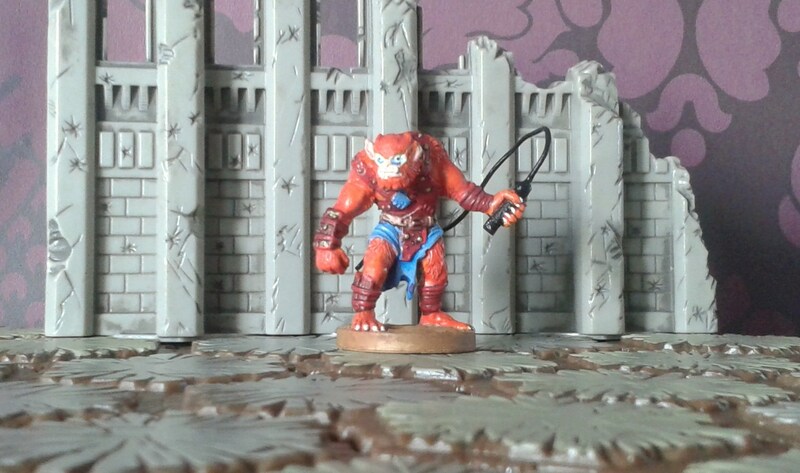 Whilst some were surprised at my choice of base figure for this conversion, now that’s he’s finished I think we can all agree he IS Beast Man! 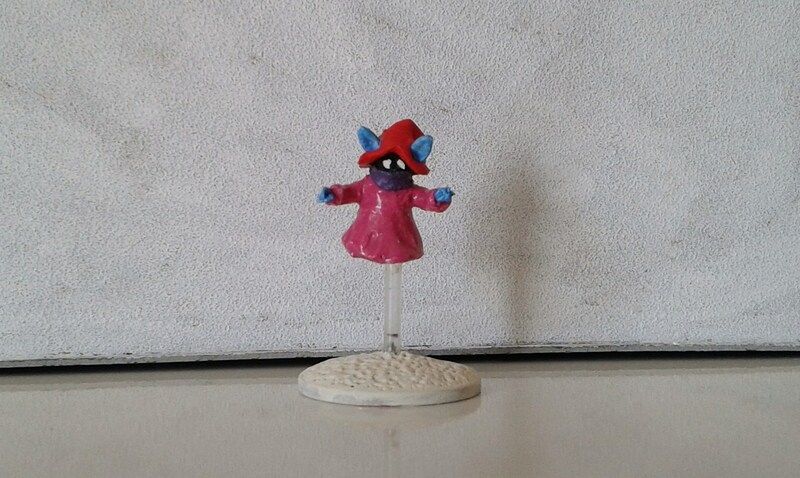 Whilst opinions are divided on the character of Orko, I have to say of this batch of Eternians, he is my favourite, as I think I’ve nailed the look and colours of the character almost spot on. 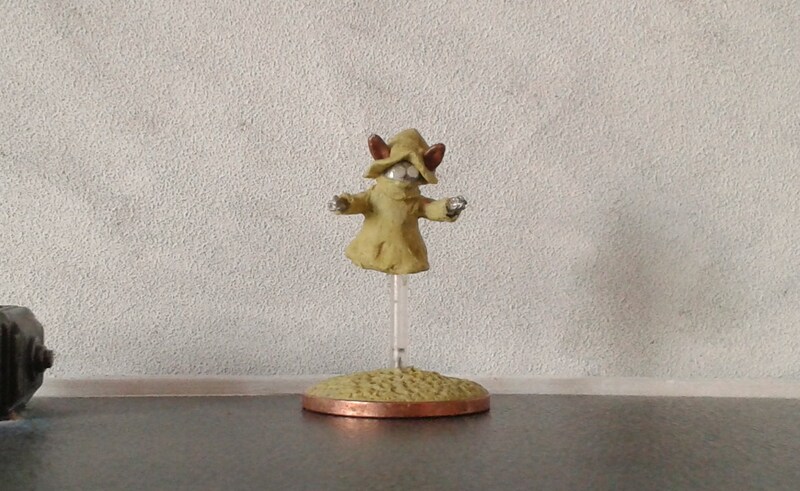 Since last time, I’ve given his hat a darker wash, applied a wash to his scarf, painted his eyes and his ‘O’, which I was dreading, but actually managed first time without mucking it up. Go me! 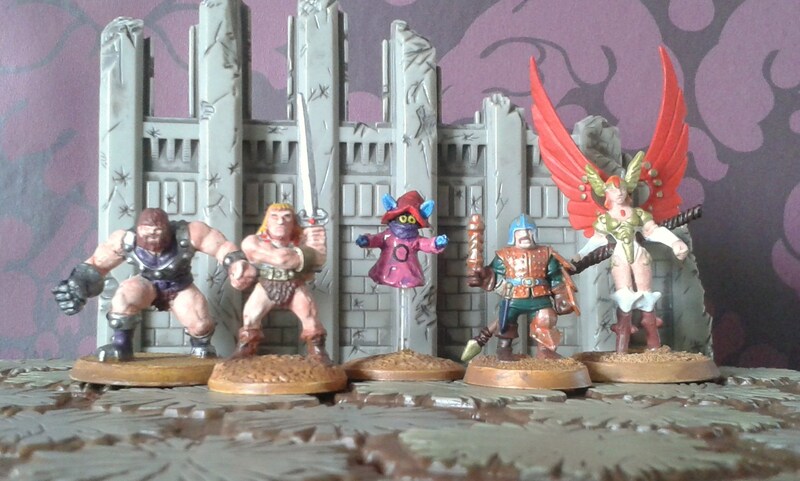 So, left to right, we have my versions of Fisto, He-Man, Orko, Man-at-Arms and a slight re-imagining of Teela. 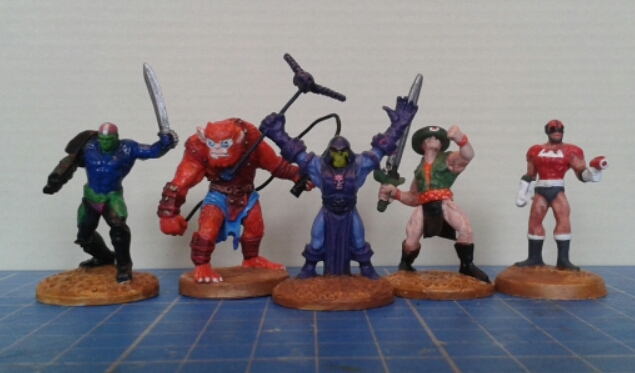 Now the Evil Warriors…and Zodac. Having realised that I’d not got Zodac’s helmet quite right, I took the opportunity to add the cheek panels and chin strap, so he looks more like his cartoon and toy version. The reason he’s pictured with the ‘baddies’ is that there would have been too many in the previous picture. As with Roger’s creations, I seem to be “hero-heavy”, so when He-Month returns in the New Year, I’ll be looking to add to the ranks of Evil. But there will be at least one more Heroic Warrior too…but you’ll have to wait to find out who the next batch of characters will be, as I think I almost broke Roger this time round. Yes, it is bonkers and I have absolutely no idea what I’m going to use him for yet, but I’m really pleased with how this side project came out. So, October beckons and I’m currently in several minds as to what to do next. Knowing me, it will probably start off as one thing and mutate into something else… But it is a Buffet and you never know what you’ll be served! Comments and feedback appreciated, as always. 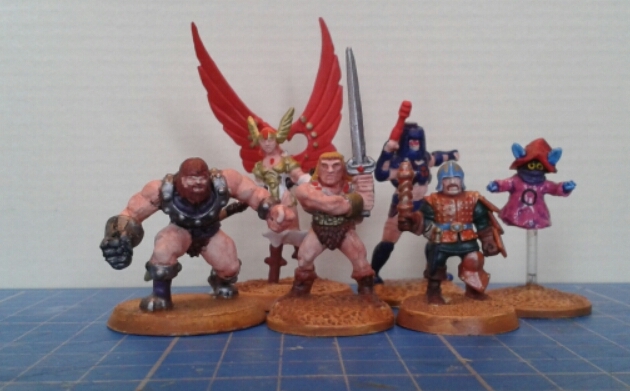 Anyway, not a huge amount of additional work has been done on my Masters of the Universe conversions – read on to find out why. We’ll first revisit Beast Man, who has had a little bit of tidying up done, where colour from one section had bled into another and he’s received several washes, to enhance the detail of the sculpt. 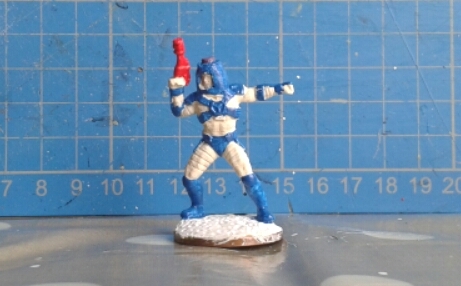 However, it appears that the colours I chose weren’t strong enough, bar the blue for his loincloth, so it actually looks like I’ve done nothing. 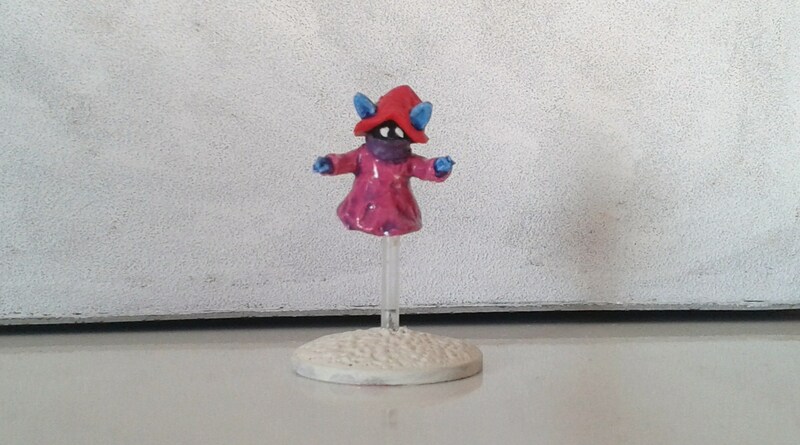 Orko has also had some washes applied, which were more successful, but it appears I’m a bit wary of painting his eyes and ‘O’, so he’s had a little work done on him, but not a great deal. Fisto, on the other hand, I have been more successful with, although he did cause me a few issues. 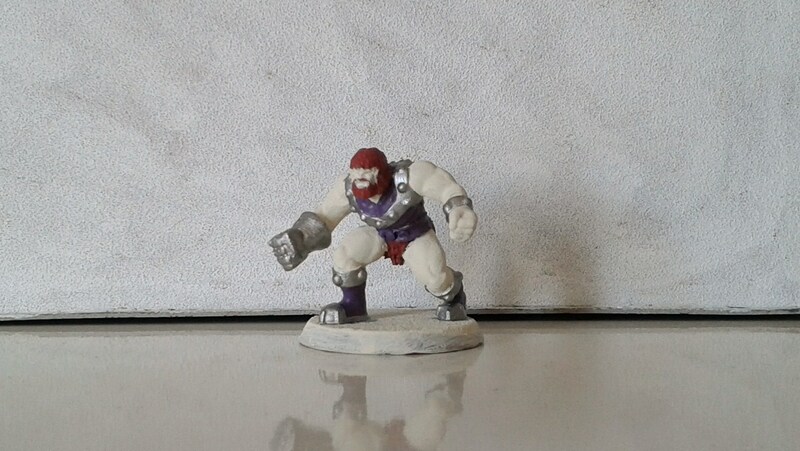 Fisto’s tunic has horizontal stripes of silver and purple, with a central vertical silver stripe running down the centre of his chest. Pretty simple to paint, yes? Well, that depends on the figure’s pose, as the DC Heroclix Mammoth figure I’d chosen as my proxy is hunched forward, which means very little of his chest and abdomen is showing. 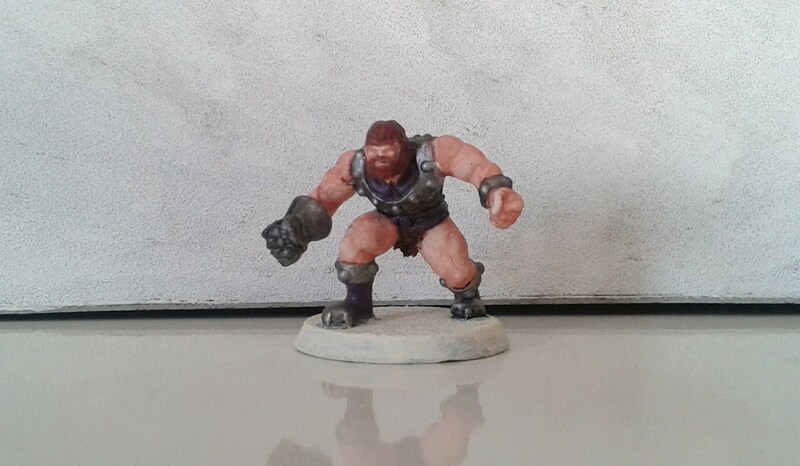 Having initially painted his torso purple, I tried painting silver stripes on. 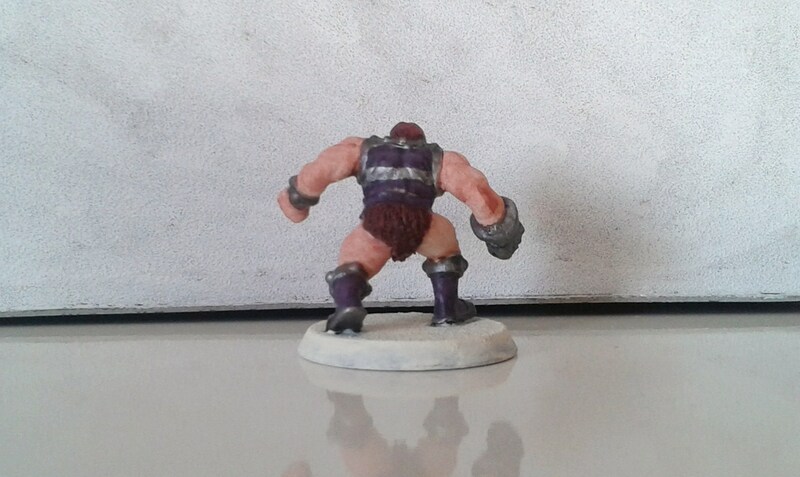 This did not go so well, so I painted his torso silver, then painted the purple bits on. This went better. I then went back and repainted his right leg where I’d managed to get both purple and silver paint on his upper thigh. And now you can understand why the other two didn’t receive as much attention. So, when we last saw this model, I’d repositioned his arms, added his accessories, sculpted his cravat and begun work on his robe. Well, the putty and tools were out again and I have now finished his robe, including overlapping it at the front, the belt suitable tied at the front, flappy sleeves (which caused a certain amount of swearing) and some attempts at creases/pleats where they would naturally form. So, as the sculpting is now done, come Monday I should be able to get some paint on him. My intentions are to complete all three Masters of the Universe figures and finish off Devil Dinosaur as well and post on my blog about it. By the end of the month. 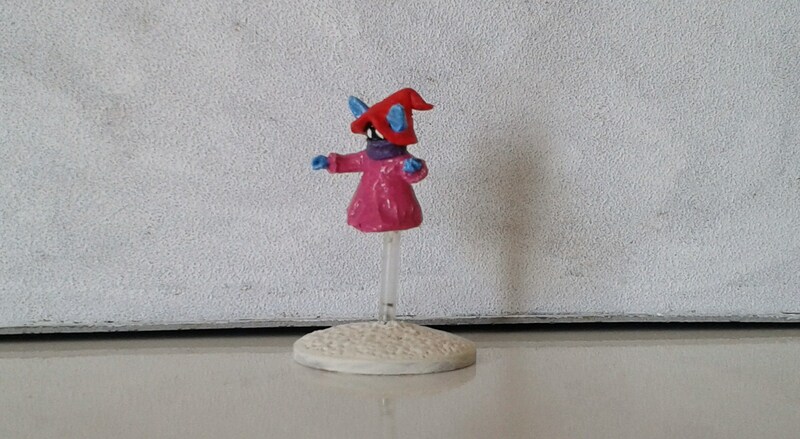 As regular readers will know, I set myself a relatively modest goal for He-Month 2, namely to recreate in 28mm the Masters of the Universe characters Fisto, Beast Man and Orko, mainly because Orko would be effectively sculpted from scratch and I wasn’t entirely sure if my sculpting skills were up to the job. 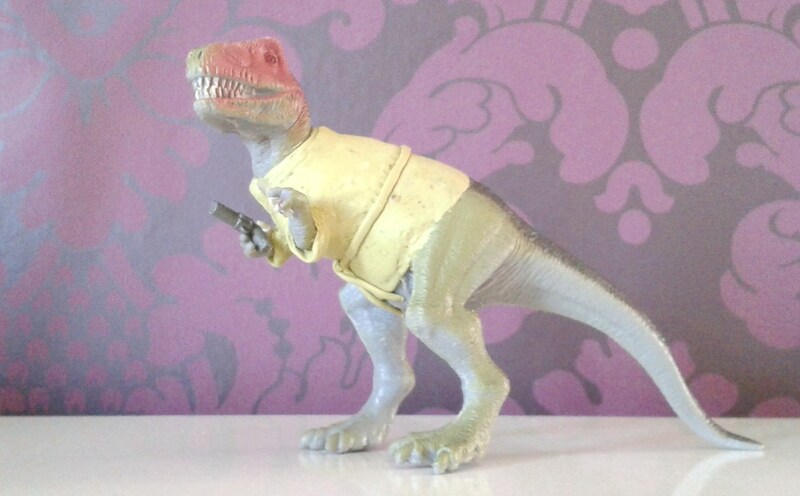 However, as stated in my previous post, I was rather further ahead than I expected, so rather than sitting on my laurels, decided to assign myself a side project, which was to re-create the version of Devil Dinosaur that appeared in issue #12 of Nextwave. 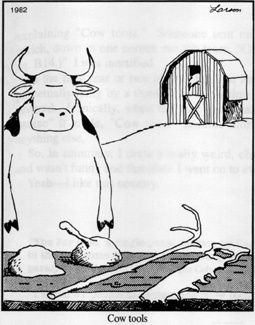 So, as my sculpting tools consisted of toothpicks, a craft knife and my big fat fingers, upon the advice of a more experienced sculptor, namely Mr Roger Webb of Rantings from Under the Wargames Table fame, I decided to try to find some “proper” sculpting tools. If you want to see what can be achieved with correct tools and talent, go take a look at Roger’s blog and prepare to be amazed. Bur first, let’s see where I am with my Masters of the Universe conversions. I’m pretty pleased with how this has turned out, as when it was undercoated it looked a little…blah. Now he has the majority of his colour, he looks a lot better and much closer to how he looked in the cartoon. Just needs a bit more detailing and I think he’ll be done. 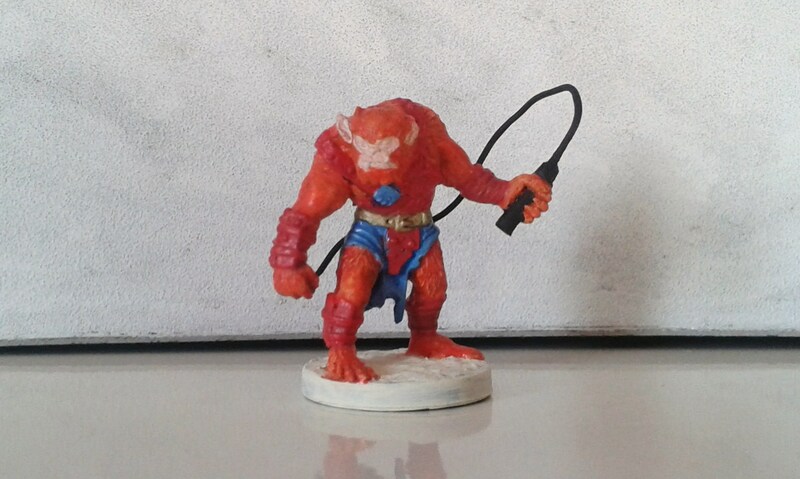 I’m really pleased with how this figure has turned out, as whilst the majority of the ‘conversion’ work was just a re-paint, the choice of the base figure and the correct colours has really made this into Beast Man, as far as I’m concerned. I think this is the best of the three, as it resembles the character almost exactly. Final detailing, including the painting of his ‘O’ (which I’m not looking forward to) and he’s done too. So, that’s the progress in Eternia, what of dinosaurs of rosy hue? I took the original plastic figure and the first order of the day was to remove the prominent eye ridges, then roughen up the areas where I’d sliced them off, to ensure they blended back into skin of the head. I also removed the prominent mold lines running down the front of each leg. As the figure’s arms/forelimbs were in the wrong position, these were cut off, re-positioned and glued into place. As the sleeves of Devil’s smoking jacket would cover the joins, I wasn’t overly concerned that rotating the limbs had created an overhang, as the cross-section of the limbs was oval, rather than circular. 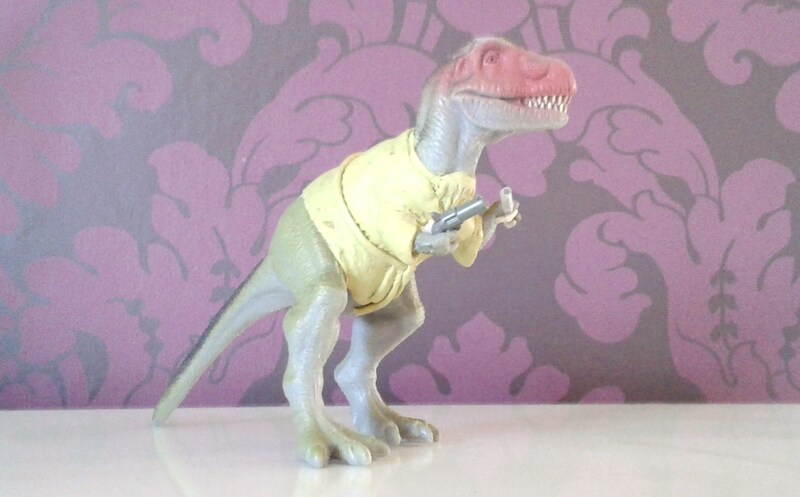 Now came the tricky part – his gun and champagne flute. 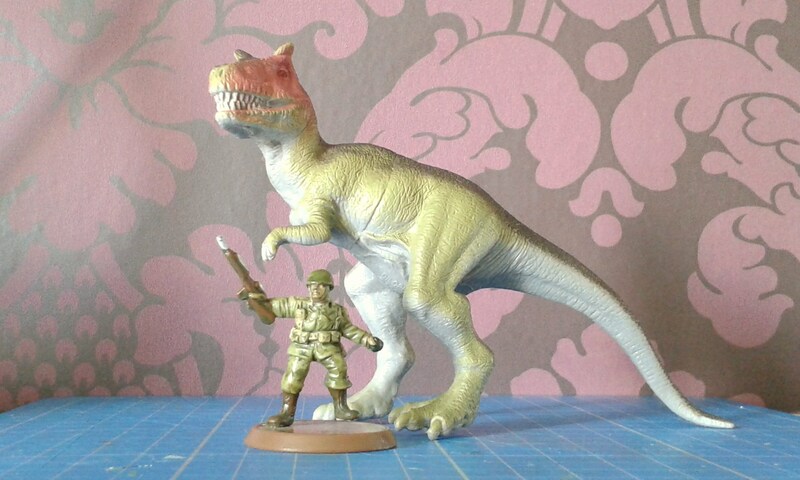 A rummage through my bits box uncovered several metal weapons, but these were more suitable for Space Marines than dinosaurs (there’s a sentence I never thought I’d write…). The box of 3 3/4″ G.I. Joe figures weapons provided a couple of potentially suitable handguns, but these were automatics and a little large. Then inspiration struck and I started rummaging through my box of Lego and uncovered a spare revolver, which I believe was part of the Adventurers range. Just the right shape and size. The champagne flute was made from another length of spent ballpen plastic tube, which was heated, stretched and twisted until it sort of resembled a wine glass. Not entirely happy with it, so this may change later, if I come up with a better alternative. 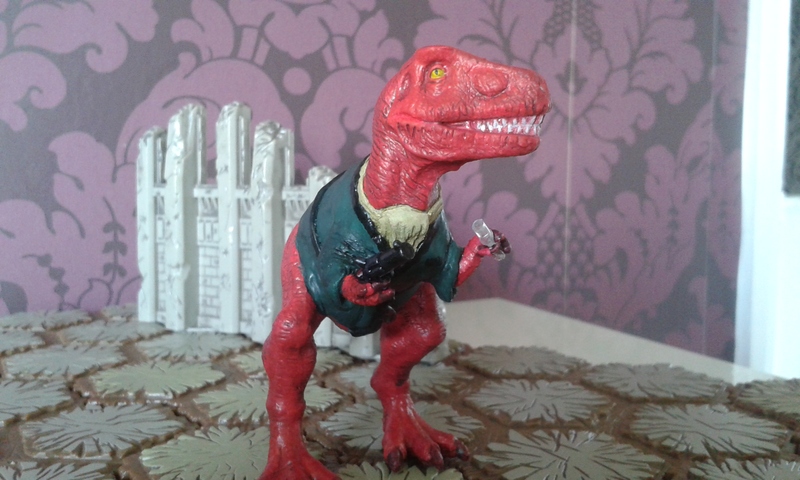 Next, Devil needed some thumbs, as the dinosaur model only had two digits and Devil Dinosaur has three. The ends of a GW Skeleton Army archer’s bow look suitable claw-like, so these were appropriated and glued into place. Out came the Milliput and my new sculpting tools and I began. I decided to do the cravat first, so a strip of Milliput was wrapped around his neck, with a big blob at the front to represent the folded over section. These were then smoothed, teased and formed into the requisite shapes, although I was having difficulty with the front of the cravat, as I’d glued his arm almost in front of this and was having issues getting smooth pleats. Of course, I then managed to knock of the offending arms by accident, as it had only been superglued in place, rather than pinned. I started to curse, then realised that this actually worked in my favour, as I could now reach the front of the cravat and the arm could then be reattached afterwards. Having mixed up a fair bit of Milliput, I then decided to begin to add the body of the jacket above the “waist”, the intention being to do this section first, then the part below the waist at a later date. Luckily, the amount of Miiliput I had mixed was just enough to do the main part of the body, with straying into the potetially tricky area where it will overlap in the front. You’ll notice he’s now got a slightly wonky foot, due to being shown to a friend, which involved being transported in a figure case which was apparently not deep enough. This shall be sorted before we see him again. So far, I’m liking my new tools and this particular project will allow me to become familiar with them, so hopefully I will get better. However, where else are you going to see a figure like this? Until next time, thanks for visiting. Comments and feedback appreciated, as always. 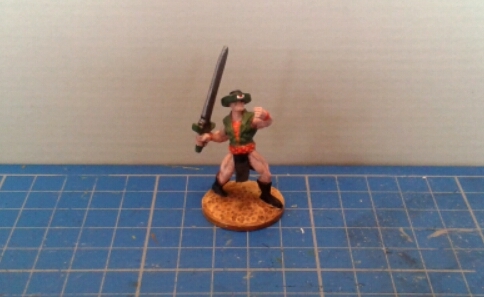 If you’ve come here expecting to see 28mm Masters of the Universe conversions, whilst you’re in the right place, you’re on the wrong post…try any of the previous posts for this month. As was pointed out to me by my co-conspirator for “He-Month 2”, the talented Mr Roger Webb, (whose far superior sculpting skills can be found over at Ranting from Under the Wargames Table) the modest target I’d set for myself for September was likely to be completed well before the month was out. Not being one to sit on my laurels, and having already planned what I was going to concentrate on for October, I needed something to occupy my hobby brain for the remainder of the month. The comic series was titled Nextwave and featured four second-string Marvel characters, namely Monica Rambeau (Captain Marvel), Tabitha Smith (Boom Boom), Aaron Stack (Machine Man) and Elsa Bloodstone, with the addition of a new character called “The Captain”, who couldn’t remember his real name. These characters formed the Nextwave squad, who were formed to combat Unusual Weapons of Mass Destruction unleashed by the Beyond Corporation. The series was violent, irreverent and whilst appeared to be set in the mainstream Marvel Universe, had flashbacks featuring characters acting wildly out of their established character, and may not have actually happened. It was also, for a long-term Marvel fan such as myself, very, very funny. 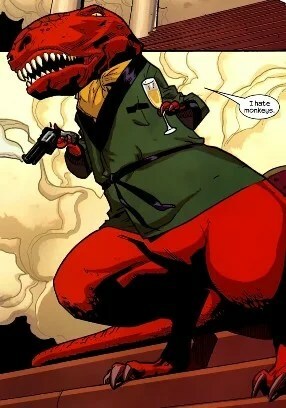 That’s right…Devil Dinosaur. But not as you’ve ever seen him before. And this image explains the title of this post. 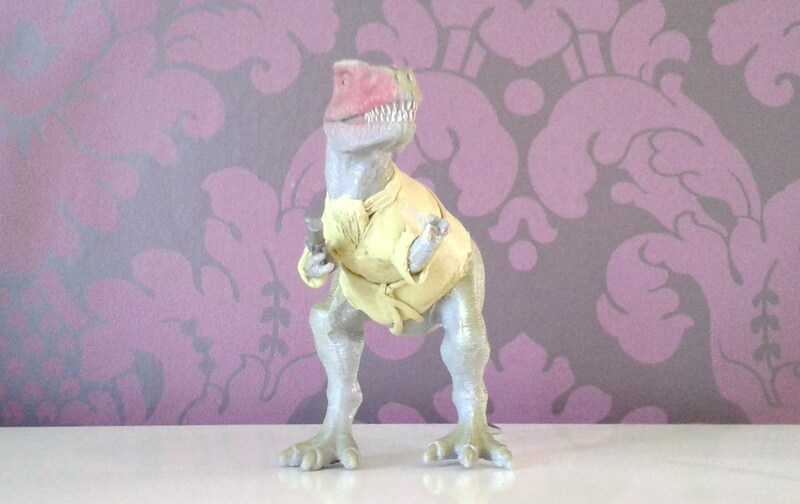 According to the writing on its belly, this model is a Dilophosaurus, which those of you who have seen Jurassic Park will know, is the crested, poison-spitting dinosaur that killed the computer programmer. 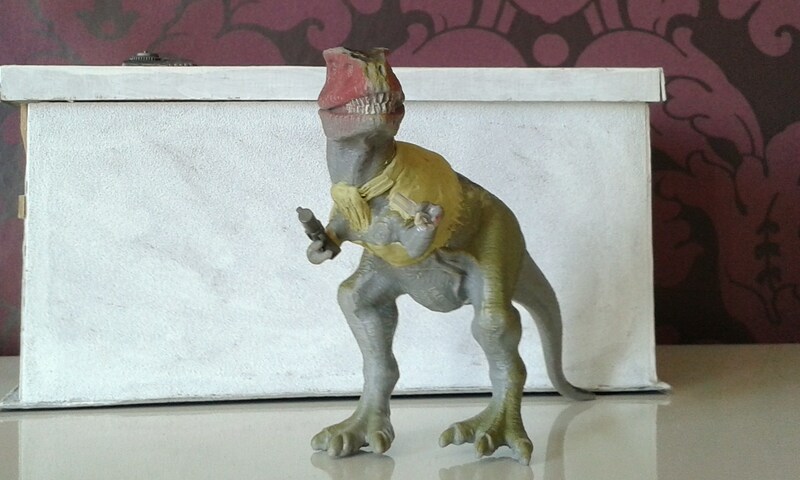 Which is looks nothing like, or the scientific reconstructions of said dinosaur. 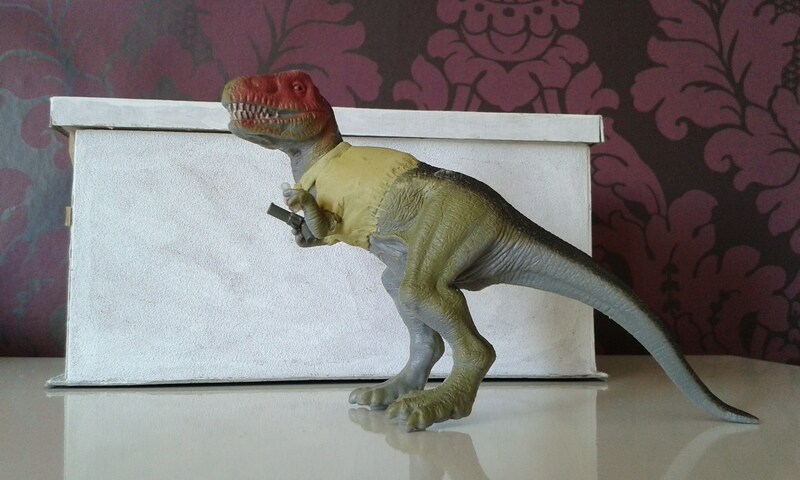 However, having said that, it is a particularly nice model, that actually looks like a dinosaur. 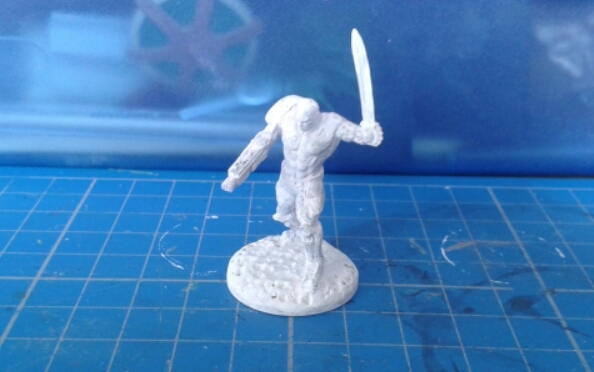 As with all injection molded figures, there are obvious mold lines, the main one being the one around it’s ‘waist’, which would have to be filled prior to gaming with it. But surface detail is good and I can imagine if you were gaming with dinosaurs, this would make a good (and cheap) addition to your collection. 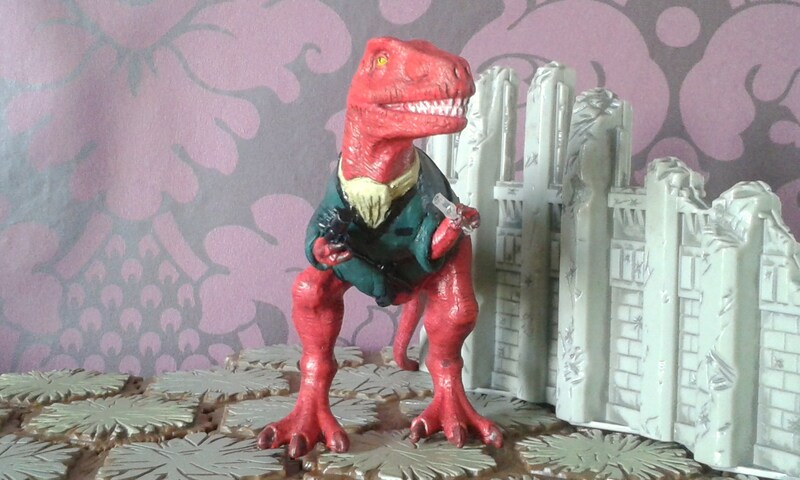 However, for my purposes, as I’m going to be converting it into Devil Dinosaur, I need to remove the ridge above the eyes, reposition the arms, find a suitably scaled revolver, try to work out how to make a suitably scaled champagne flute, and sculpt on a cravat and smoking jacket, before I can even start applying paint. So, He-Month 2 and the Devil Dinosaur will run alongside one another for September, and will hopefully all be finished by the end of the month.